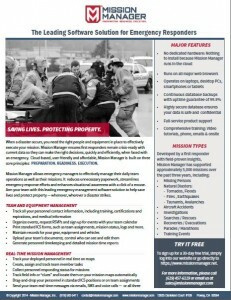 When a disaster occurs, you need the right people and equipment in place to effectively execute your mission. Mission Manager ensures first responders remain crisis-ready with current data so they can make the right decisions, quickly and efficiently, when faced with an emergency. Cloud-based, user-friendly and affordable, Mission Manager is built on three core principles: PREPARATION. READINESS. EXECUTION. 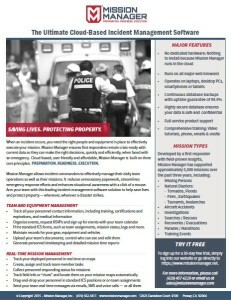 Mission Manager allows emergency managers to effectively manage their daily team operations as well as their missions. It reduces unnecessary paperwork, streamlines emergency response efforts and enhances situational awareness with a click of a mouse. Arm your team with this leading emergency management software solution to help save lives and protect property — whenever, wherever a disaster strikes. Print standard ICS forms, such as team assignments, mission status, logs and more. To sign up for a 30-day free trial, simply log into our website or go directly to https://www.missionmanager.net.